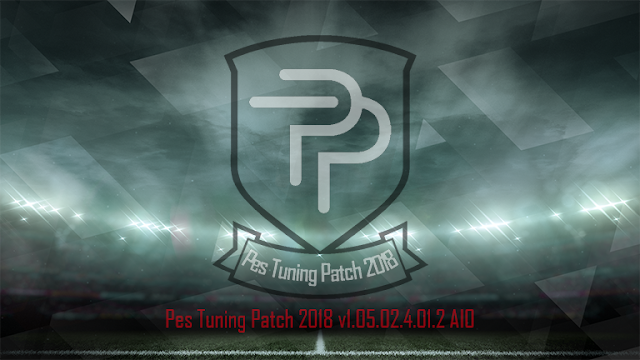 PES 2018 Tuning Patch V1.05.02.4.01.2 AIO – Berikut fitur patch PES 2018 terbaru dari PES Tuning Patch V1.05.02.4.01.2 AIO. -Ligue 1 Conforama, Serie A TIM, Eredivisie, LaLiga Santander, Liga NOS, Bundesliga, Campeonato Brasileiro, Superligq Argentina and more => Full licensed league with correct Teams Names, Logos, Emblem, Formations / League Logos / Squads / Managers / Players / Kits, Font. - Domino’s Ligue 2, Serie B ConTe.it, LaLiga 1|2|3, Campeonato Scotiabank and more => Update with correct Teams Names, Logos, Emblem, Formations / League Logos. - 2018-2019 summer transfers: Last summer transfer of 31/08/2018 (list). - Includes lastest PES2018 Patch 1.05.02. - Includes lastest PES2018 Data Pack 4.01. - Badge: Added new badge for some leagues. (Serie A TIM, Serie B ConTe.it, LaLiga Santander, LaLiga 1|2|3, Liga NOS, Bundesliga, more). - Boot: Added 100 new boots. (Boot Pack by Tisera09). - Chant: Added new chants & national anthems. (Chantpack & National Anthems by predator002). - Face: Added 728 new faces. - Glove: Added 100 new gloves. (Glovepack by Tisera09). - Kit 2018-2019 season: Added new kit of 2018-2019 season. (Kitspack by Lucas RK (list)). - Minifaces: Added 2500 new formation pictures. - Referee Kit: Added 6 new referee kits. (Bundesliga, Generics + UCL, LaLiga Santander, Ligue 1, Premier League, Serie A TIM). - Scoreboard: Added 8 new scoreboards. (Bein Sports, Bundesliga, Copa del Rey, LaLiga 1 2 3, LaLiga Santander, Ligue 1, Premier League, Serie A TIM). - Tattoo: Added 300 new tattoos.